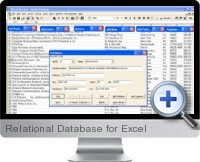 The Excel Relational Database provides the Excel user with a database integrated into the Excel environment with worksheet based tools for processing data and generating reports. Relational Database for Excel is suitable for any data centric business discipline such as system building, modeling and financial services, accounting, scientific, engineering, and statistical. Excel worksheets can contain tables or be used as forms to browse or update the database. Lists can be generated for in-cell drop downs, windows managed, and buttons or menus can be used as controls. Worksheets can also be used to provide a simple environment to maintain data and selection options. Reports are Excel workbooks generated from the database which provide the user with considerable flexibility in how the data is viewed. They can be distributed to users who do not have the database access and retain their functionality. Reports provide a simple way to present results to users or clients and can also be distributed by email. Logic sheets are special Excel worksheets which can handle complex logic, calculation, data navigation or report generation using only the tabular and relational structure of the worksheets without the need for VBA programming. Models with multi-stage calculations can easily be applied to multiple sets of data. The relational database can store data separately from the workbooks, so it can be shared between workbooks and (with the multiple user version) between users. It can also manage complex data structures and protect the security and integrity of the data.